A CalTrain roars through the University Avenue CalTrain station in a blur of red and silver, creating a large gust of wind that tousles hair and threatens to blow hats away. Gesturing animatedly and raising her voice over the din, Debra Kahrson, a postdoctoral student at Stanford University, sings her praises of public transportation. Kahrson gestures enthusiastically as she declares her love for public transportation. “I love eavesdropping on people’s conversations on the train,” Kahrson says. Photo by Michelle Li. Alicia Szebert, a science teacher at Palo Alto High School, has also experienced the benefits of public transportation. Like Kahrson and Szebert, many others who work and reside in the Bay Area rely on public transportation to commute from far-away homes to their jobs while reducing greenhouse gas emissions and the demand for resource-intensive production of cars. Emissions have recently become an important concern to the public due to indications from our new president that he will pursue a climate change agenda that is starkly different from that of President Barack Obama, as evidenced by the fact that Donald Trump has alluded to the possibility of removing the Environmental Protection Agency, discontinuing Obama’s Climate Action plan and withdrawing from the Paris COP21 accord. With these concerns in mind, public transportation is on track to become the future’s method of getting from point A to point B; however, easy access mass transit still faces hurdles on the path to ubiquity, including a lack of funding before November and dearth of low-income riders. 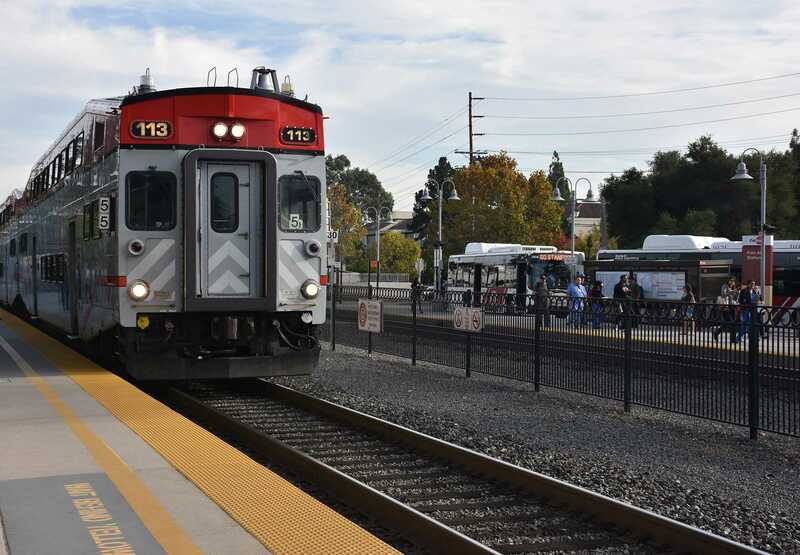 Currently, Palo Alto residents enjoy a variety of public transportation services, including the VTA’s paratransit program, SamTrans, buses over the Dumbarton bridge, CalTrain, Palo Alto’s free shuttles and the BART lines. Students also rely on the free cross-town shuttles to attain greater mobility.Hannah Pan, a junior at Paly, values public transportation for a variety of reasons. Despite its benefits, the shuttle system remains imperfect, and some students call for its reform, like Miguel Moreno, a junior. “There needs to be an increase in number of shuttles on popular routes,” Moreno says. A variety of benefits stem from public transportation usage, including a decrease in commute-related stress in addition to a reduced carbon footprint. Szebert, who gave her car to her brother and now relies solely on ridesharing services and Caltrain, says that as a result, she has reduced her carbon footprint significantly. “Getting rid of my car has helped the environment in many ways, not just the everyday burning of fossil fuels, but my brother doesn’t have to use all the resources to buy a brand new car,” Szebert says. On the other hand, in cities like Palo Alto, many families own multiple cars and drive them on a daily basis, which is detrimental for the environment. The CalTrain station near University Avenue provides a convenient stop for those employed Downtown or at Stanford University. Photo by Michelle Li. Many have started to take advantage of the plethora of benefits that mass transit provides, thus, it seems self-evident that the next step should be to expand the Bay Area’s public transportation network to allow more people to access its benefits. Multiple riders, also feeling the effects of the boom in public transportation usage, echo the sentiment that the public transportation system ought to be reformed, although there is not necessarily a clear consensus regarding what riders want. Frequent rider Bryan Sheehan, a worker in downtown Palo Alto, takes a different approach to public transportation reform. Instead of increasing the number of trains, he expresses interest in future efforts to have trains run more often. Sheehan, who works downtown, praises CalTrain for being quick and convenient. “Not having to sit in rush hour traffic is the biggest thing [reason why I take CalTrain],” Sheehan says. “I also can’t do any extra work in the car.” Photo by Michelle Li. In addition to expanding the system itself to accommodate more riders at more frequent times, the next step should also include outreach to populations who historically have not used, but could benefit frompublic transportation. Currently, public transportation can be very expensive, thereby rendering it inaccessible to citizens with lower incomes in poorer communities. This is especially the case for people who have long commutes, like Szebert. “Ubers every month are costing me about $200 or more, and the train itself costs about $200,” Szebert says. Joe Baker, another postdoctoral student at Stanford, expresses his thanks for the fact that his position comes with free access to a useful form of public transportation, namely CalTrain. “Now that postdocs get CalTrain pass-es for free, it’s a huge deal and essentially allows us to commute for free,” Baker says. To bridge the gap between the haves and have-nots of transit, a non-profit called the Palo Alto Transportation Management Association has launched programs to increase access to public transportation. To make mass transit universal, Kahrson suggests that society as a whole should reconceptualize public transportation.